My mother Patricia Veronica Tye passed away on 27th of December 2018. Since then her ashes have been in my front room surrounded by pictures of her and my late father and candles, a sort of shrine. The plan was to lay her ashes to rest at Parndon Wood crematorium’s August garden of rest where my father’s ashes were placed. 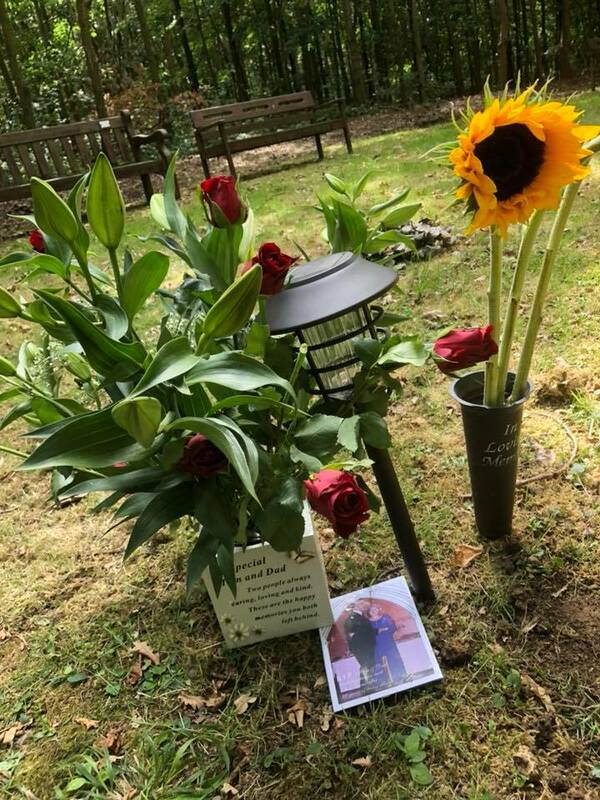 I didn’t want to keep her ashes for such a long period but my son and daughter wanted to attend and trying to find a suitable date for all seemed impossible. My father passed away on the 20th of August 1979 so I decided that I would lay mum’s ashes to rest on the same day regardless of whether my children could come or not as this was something that really needed to be done and today seemed an appropriate day to do it. Thankfully both of my children along with their partners were able to come. As you can imagine it was a very emotional day for all concerned but now mum is finally at peace and after thirty-nine years of living alone she is now reunited with the man she loved and dad reunited with the woman he loved. For thirty-nine years mum remained faithful to her husband, not wanting or even looking at another man. R.I.P mum and dad, finally together again.